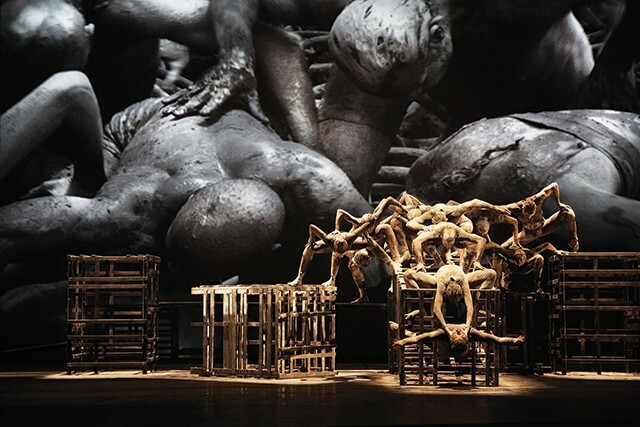 Grupo Corpo dance company in Cassi Abranches' Suite Branca. This past year was a banner one for touring dance productions gracing Pittsburgh stages. 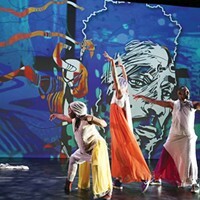 From the Cultural Trust’s Pittsburgh International Festival of Firsts, featuring the U.S. premiere of Haitian dance company Ayikodans’ Cri des Nago and France’s Aurélien Bory and Compagnie 111’s ingenious ESPÆCE, to the Kelly Strayhorn Theater’s presentation of Michael Sakamoto’s intercultural work Soil and the Dance Council showcasing Los Angeles contemporary dance innovators BodyTraffic, 2018 was a veritable dance smorgasbord. Grupo Corpo (Byham Theater, Jan. 17) The Brazilian super-troupe came to town with a program looking back on its 43-year history of unique choreographic works that fuse modern dance, Brazilian street dance, ballet, and more. This program also marked the first time the company presented work by someone other than its resident choreographer Rodrigo Pederneiras. 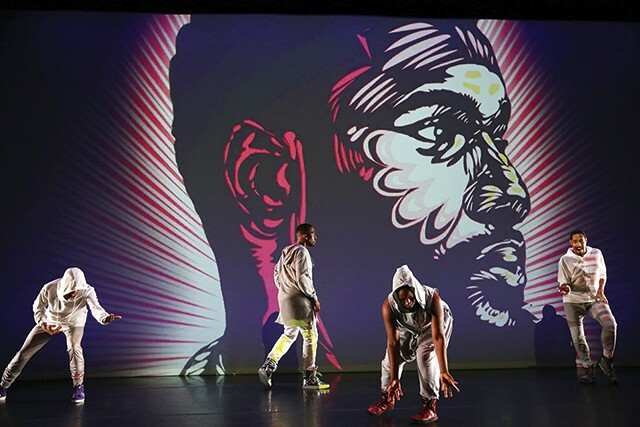 Wang Ramirez - Borderline (Byham Theater, March 7) Together, former hip-hop B-boy Sébastien Ramirez and ballet-trained Honji Wang have created a hybrid movement language that may be the forerunner for a new stylistic wave in dance. 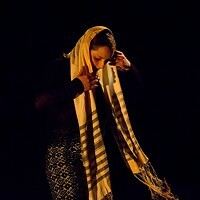 In Borderline, they added rigging (cables, harnesses) for an exploration of human relationships and social boundaries. Cynthia Oliver Co. - Virago-Man Dem (Kelly Strayhorn Theater, Sept. 28-29) Co-commissioned by KST, Bessie Award-winning choreographer Cynthia Oliver’s abstract dance-theater work presented a nuanced study on masculinity within cultures of Caribbean and African-American communities that was both image-rich and skillfully performed. Deborah Colker Dance Company - Cão sem Plumas (Byham Theater, Oct. 13) The U.S. premiere of the Brazilian troupe’s 2017 multimedia masterwork, Cão sem Plumas (Dog Without Feathers) combined contemporary dance movement with filmmaker Cláudio Assis’ high-definition black-and-white film themed around the impoverished riverside population of the Capibaribe River Region in Brazil to create a visually stunning work about resiliency and beauty in the face of injustice. Yabin Wang & Her Friends - The Moon Opera (Byham Theater, Nov. 13) The North American premiere of award-winning Chinese choreographer Yabin Wang’s 2015 dance drama told the story of aging Peking opera star Yanqiu, who struggled between dreams of artistic stardom and her traditional role as a woman in Chinese society. Featuring a spellbinding performance by star dancer Ying Peng as Yanqiu, the haunting work was exquisitely-crafted and indelibly memorable. The Hip Hop Nutcracker (Benedum Center, Dec. 11-12) One of the most unique, refreshing, and entertaining takes on The Nutcracker story to come along in recent memory, director/choreographer Jennifer Weber’s reimagined tale set in contemporary New York City combined Tchaikovsky’s iconic score with old-school hip-hop and dance to create pure theatrical magic. Related Yabin Wang's The Moon Opera makes its North American debut in Pittsburgh: This performance qualifies as a must-see for area dance fans. This performance qualifies as a must-see for area dance fans.